We met at a local coffee shop at daybreak around 5:30 AM on the Thursday before Memorial day (6/23/13). After a half café (I have been off of coffee for almost three weeks so this will be more than enough to get started) we would fire up the Road King and Glides respectively and set out for our first of 1,050 miles. The route we choose was specific to get us past the 1,000 mile mark, use enough highways to make good time and avoid known traffic areas such as Hartford, CT, New York City and Washington DC. 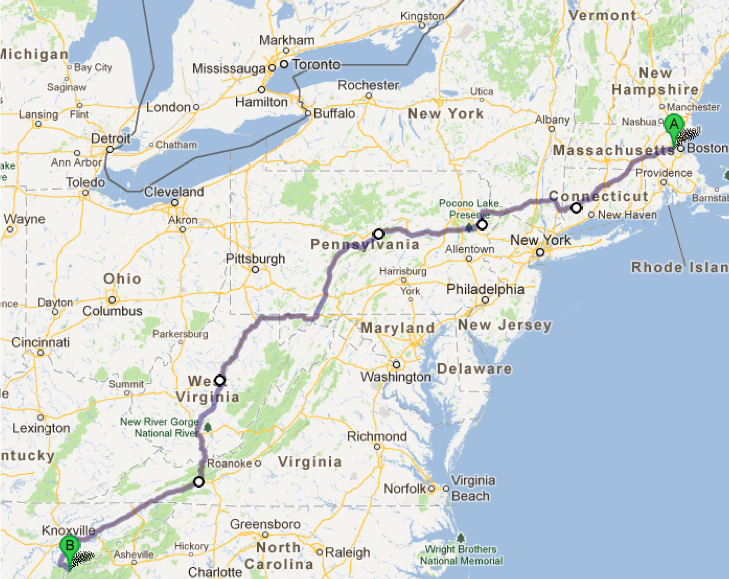 We would ride West through Albany and then turn South toward PA, WV, VA and TN. The first 50 miles was uneventful until my buddy said that he was low on fuel… How could that be? He has a 6 gallon tank and said he had filled it the day before leaving. He did recently drop a 120 CI motor in without having it fully tuned but even a stock motor will run more than 80 miles before emptying out. We pulled into a station on I90W and filled up. His bike only took 2.5 gallons – he was no where near empty. Apparently he was in traffic the day prior and his onboard computer calculated his mileage based on the historical data from days past. On an interstate at speeds between 60-70 he would receive better mileage. Thankfully we wouldn’t have to make 14 stops on the way as I briefly started to fear. We passed through NY and into PA and dealt with some of the nation’s worst roads. I’ve ridden in PA before and do not recollect such terrible terrain but here we are, dodging potholes at 70 MPH eating granola bars as we rode and trying not to let the now 85 degree weather get to us. Most of the riding was pretty straight forward with the exception of seeing State Troopers every 10 miles in West Virginia. We were entering a holiday weekend but they were not taking speed infractions lightly. We would actually have to obey the limits on this stretch of tarmac as a speeding stop would set us back on our timing. West Virginia leads to Virginia and then back to West Virginia again. It seemed that we were going back and forth from one state to the next more often than we should have. I had to check the maps at one point just to make sure I hadn’t inadvertently done a loop. Nope, it was just the cut-out of the states. Clearly I should’ve paid more attention in Miss Ross’ 9th grade geography class. At one stop in VA we checked the Doppler and saw some nasty storms coming in. I have never seen so much red nor a red rectangle surrounding a weather system on a Doppler and was unsure of it’s significance but knew that we were going to get wet. We debated waiting it out or riding through it. Time was important so we put on our raingear despite the now 92 degree weather and sweated it out down I-81 through VA.
All of a sudden with no warning at all the skys blackened, the trees blew with ungodly fury and rain pelted us as though dozens of garden hoses were pointed directly at us on the “stream” setting. Soon that rain turned to ice. The ice grew in size and golf ball sized hail was coming at us from all directions. When you’re on a motorcycle the hail bounces off the tank so it actually hails up as well as down. It was impossible to see past my fairing and I was down to 40 MPH. I would pull over but was sure a truck would hit me if I tried. Traffic was not light before the storm and I could barely keep my eyes open (due to the ice) for long enough to look in front. Then it happened – a gray ford tempo without any lights was stopped in the middle of my lane. I jammed on the brakes of my 1,000 pound machine and headed straight toward that car’s bumper. At the last second I jerked the bike to the right and then to the left and skidded the length of that car and then past an 18 wheeler in front of that car (who was also at a dead stop). My buddy was a short distance behind me and he pulled up behind me shocked I was upright. We pulled the bikes back toward the truck to have shelter on one side of the storm, held our bikes with one hand and covered our faces with the other. The wind wasn’t blowing in one direction – it was blowing in all directions – spinning angrily in a way I hadn’t experienced before. The only thought going through my mind was that we were in a Tornado similar to the one that destroyed a town in Oklahoma and killed hundreds of people just the week prior. After 10 minutes or what seemed to be an eternity the storm was gone as quickly as it had arrived. We assessed some damage and set out for an exit. At the exit we were pleased to see that there were barely any markes on our bikes despite the pelting a few moments prior. Unfortunately the items in my bags weren’t quite so lucky as these speaker lids are not as watertight as the stock lids. This forced me to listen to the radio instead of my ipod for a stretch. Immediately after switching the radio on, there was an interruption from the emergency broadcast system telling people in the surrounding towns – the towns I had just come from, to take cover as a Tornado had been documented. We were spared but this was my closest call to a disaster. We would ride on – keep the rain suits on to dry and hit more spells of warm and then rain but nothing as bad as that stretch in Virginia. In all, we hit five rain storms, took cover from one in a gas station as it caused a small flash flood (no big deal) and eventually nightfall rolled in. Most of the ride was to be on highways due to time constraints but I had mapped a few side roads for us to ride. VA 219 and WV 460 would be spectacular roads any other day but unfortunately I hadn’t assumed that rain, bugs and nightfall would get in the way of this beautiful landscape. This made for a challenging 150 mile stretch that led us to a local gas station by Wytheville VA. We had been riding for over 15 hours hours by this point and the weather was not cooperating. At that very moment when we had already ridden 750 miles but had a quarter of the trip to go. I was stopped at the station, a local retiree made his way over to my bike. He clearly saw exhaustion in my face, assessed the weather and handed me a business card. He was part of a Christian Biker group and offered me any help I would need as I continued down the road. If we needed a bite to eat, a place to stay or spot to work on our bikes, he’d come and get us and help however he could. Luckily we didn’t need his help but this gesture alone went a long way for my attitude. Now I was confident we would make it to the finish line and excited to take on the rest of the journey. A few rain storms later we arrived at an iHop in Knoxville TN. We had ridden 1,050 miles in just over 20 hours. We were excited, tired and most of all hungry. A few griddle cakes would be the right end to this grueling and adventurous day! The weather didnt cooperate at all did it! Great job!